Earlier today, Marvel artist Joe Quesada shared a poster for The Defenders, and to say it’s stunning would be a total understatement. While a low-quality version was spotted at the show’s wrap party, this one offers up a much closer look at the cast and is definitely wallpaper worthy. As you can see, it shows Matt Murdock/Daredevil (Charlie Cox), Luke Cage (Mike Colter), Danny Rand/Iron Fist (Finn Jones), and Jessica Jones (Krysten Ritter) all…well, in their civvies. Of course, considering the fact Daredevil is the only member of The Defenders to wear a superhero suit, that makes a lot of sense. Looming in the background are Sigourney Weaver’s mysterious villain and a character who looks a whole lot like Elodie Yung’s Elektra. When we last saw her, The Hand was attempting to resurrect the Man Without Fear’s former flame, so this may very well confirm that Weaver’s character is part of that ninja clan. Set to premiere this August, The Defenders is going to run for eight episodes and is currently shrouded in much secrecy – as expected. Nothing is known about the plot and only a handful of set photos have found their way online, but fans are hoping it will deliver a satisfying team-up after years of solo adventures for the heroes. 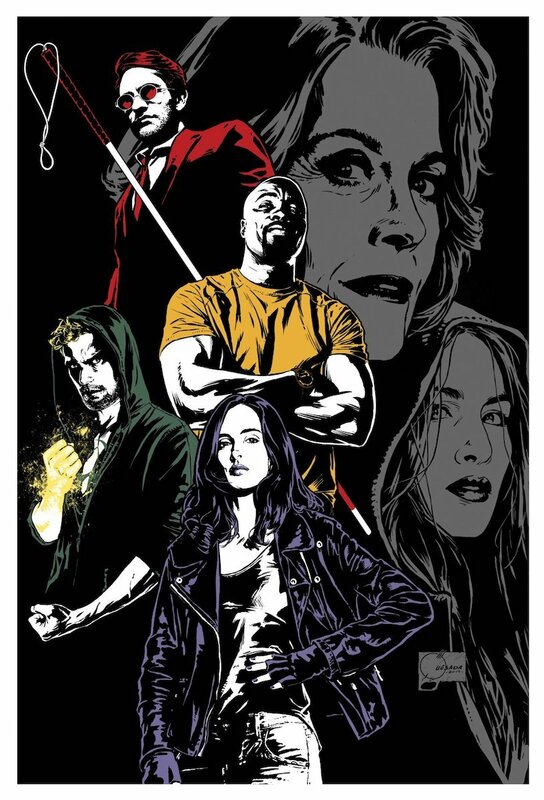 With Comic-Con taking place in July, chances are Marvel and Netflix will make us wait until then for a first look at The Defenders, but in the meantime, gorgeous artwork like this should be more than enough to tide us over.